Batumi (Georgian: ბათუმი; Armenian: Բաթումի; also known as Batum) is the capital city of the Georgian autonomous region of Adjara. Since the Rose Revolution and the presidency of Mikheil Saakashvili, the city has become a prime tourist destination for vacationers from Armenia. 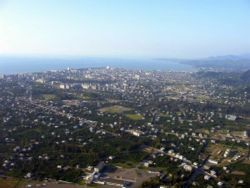 In 2006, Batumi was twinned with the northern Armenian city of Vanadzor. After Georgians (104,313), Armenians (7,517) comprise the second-largest ethnic group in the city. President Robert Kocharian and his Georgian counterpart Mikheil Saakashvili released on Monday few details of their latest talks held in the Georgian Black Sea city of Batumi over the weekend. The two leaders avoided speaking with journalists after the meeting on Sunday. The statement said the two leaders then visited the nearby town of Kobuleti, with Saakashvili briefing Kocharian on his government’s efforts to promote tourism in Georgia’s autonomous Republic of Ajaria, of which Batumi is the capital. Ajaria, and Kobuleti in particular, has become in recent years one of the most popular destinations of Armenian holidaymakers attracted by its seaside resorts and accommodation prices that are often lower than in Armenia. Tens of thousands of them visited the region this summer. Saakashvili’s office did not issue any statements on the talks. According to the Georgian Caucasus Press news agency, he and Kocharian also discussed the situation in Javakheti, a volatile region in southern Georgian mainly populated by ethnic Armenians. In addition to exchanging official visits, Saakashvili and Kocharian regularly hold informal meetings in famous Armenian and Georgian resorts. Their previous one-on-one encounter took place in the Armenian ski resort of Tsaghkadzor in March. Armenia confirmed on Tuesday plans to open a consulate in the Georgian Black Sea resort of Batumi, which reflect the city’s and nearby areas’ growing popularity among Armenian holidaymakers. The Foreign Ministry in Yerevan said the issue was discussed at a meeting on Monday between Hrach Silvanian, the Armenian ambassador to Georgia, and Levan Varshalomidze, the prime minister of the autonomous republic of Ajaria, of which Batumi is the capital. A ministry statement quoted Varshalomidze as saying that the opening of an Armenian diplomatic mission there is becoming a “necessity” because of an ongoing influx of Armenian tourists to the Georgian Black Sea coast. “The Armenian ambassador said that the issue is being considered by the Foreign Ministry of Armenia and will receive a positive solution in the near future,” the statement said. Batumi and other Ajarian resorts have become in recent years one of the most popular travel destinations of Armenian vacationers attracted by their proximity and relatively low cost. Staying in many of Armenia’s traditional holiday spots may well be more expensive nowadays. The influx of Armenian visitors has also been facilitated by improved security and a crackdown on Georgia’s formerly corrupt traffic police that was launched by the administration of President Mikhail Saakashvili more than two years ago. According to Varshalomidze, as many as 35,000 Armenians have already visited Ajaria this summer and another 10,000 are expected to do so this month. The official was also quoted as urging Armenian entrepreneurs to invest more in the local tourism and agribusiness sectors. Saakashvili has made similar calls in the past. Batumi is also one of Georgia’s two Black Sea ports that handle the bulk of landlocked Armenia’s external trade. Incidentally, the last meeting of a Georgian-Armenian intergovernmental commission on economic cooperation was held in the Ajarian capital, underscoring its economic significance for Yerevan. This page was last edited on 15 October 2018, at 05:28.